Jacques Roëttiers, Graveur Genéréral at the Imperial Mint in Brussels, died in 1772. According to some sources Van Berckel applied shortly afterwards for the vacant position. He was rejected because he made conditions that the government of the Austrian Netherlands did not want to accept. Four years later no successor had yet been found and the government decided to institute a competition for which die cutters from throughout Europe would be invited. In the end five engravers registered, amongst them Van Berckel. The competition took place from the 19th August 1776 and a detailed report of the proceedings was made, showing exactly when a particular task was performed and its duration. Unfortunately the report does not state the subject of the task. There is only a reference to a 'bust', but whose bust this was, has remained a mystery for a long time. 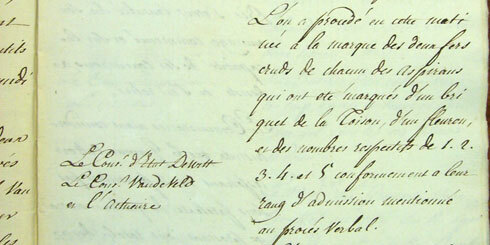 Page from the competition report which resulted in Theodore van Berckel obtaining his position as Graveur Général. We have to thank the Belgian Xavier Duquenne for solving the riddle, almost two hundred years later. In hindsight the solution was obvious. From the report, we know that each candidate was given two pieces of rough steel. 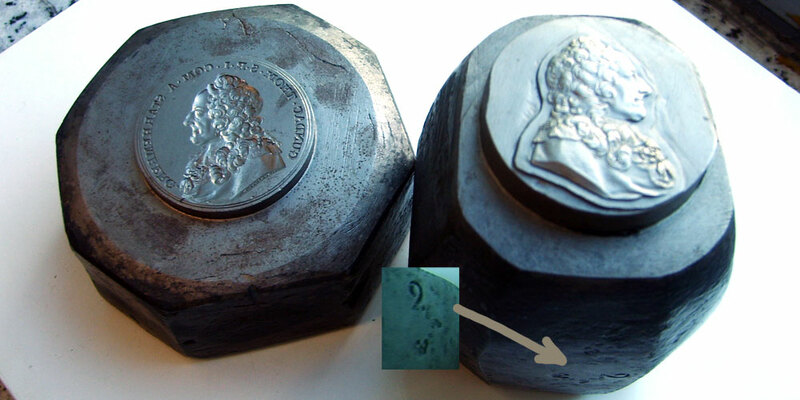 These pieces were stamped and numbered 1 to 5 (see the picture of the competition report). 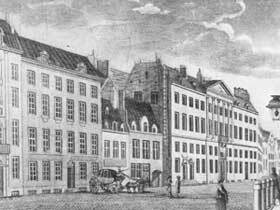 To this day the Mint of Brussels stores a large number of dies made by Van Berckel. Duquenne researched all of them carefully and did indeed find a mother die (puncheon) stamped with two marks (a lily and a briquet) and the number ‘2’. The report shows that Van Berckel was known as candidate nr.2 and the marks are noted in the report as well. Duquenne publicised his findings in 1972 in ‘Théodore van Berckel – Graveur Général de Monnaies des Pays-Bas Autrichiens’. 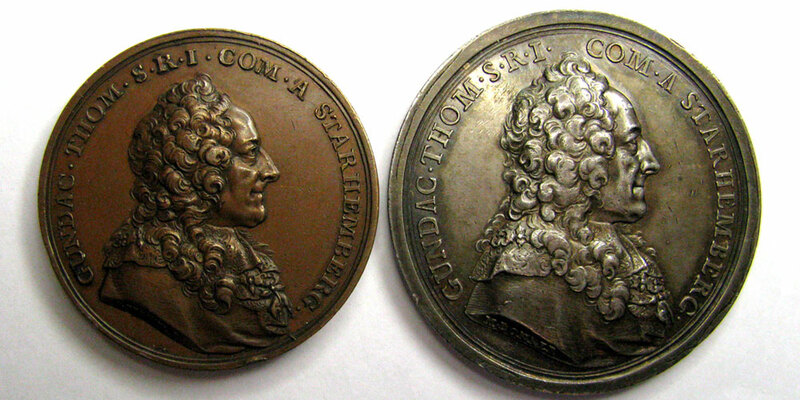 Proof had been established and the medal was identified: a commemorative medal for Thomas Gundackar Count of Starhemberg. The die from 1776 with the portrait of Thomas Gundackar, Count of Starhemberg. Those appreciating Van Berckel’s work were, of course, already aware of the medal. Collectors had often wondered why he would have produced this medal. Starhemberg was an Austrian minister who died on the 8th July 1745 in Prague. Matthäus Donner, the well known Viennese die cutter had struck a commemorative medal at the time of the minister’s death, which had been copied by Van Berckel in identical but slightly smaller format. But what had been the purpose? Now that Duquenne had shown that this copy was in fact the task of the competition, the mystery was solved. Georg Adam von Starhemberg was the plenipotentiary minister for the government of the Austrian Netherlands in Brussels. As such he was closely associated with the organisation of the competition. Georg Adam also happened to be a grand nephew of Thomas Gundackar and it is probable that he proposed that the medal of his great uncle should be used as an example. During the course of the competition, candidates had dropped out one by one, for various reasons. In the end, only Van Berckel finished the competition task. 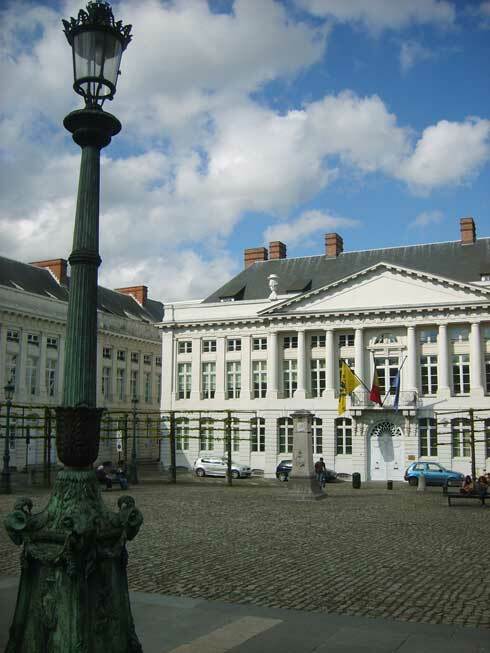 Theodore Victor van Berckel was therefore able to start work virtually immediately as Graveur Général at the Imperial Mint of the Austrian Netherlands in Brussels. In addition, he was allowed to work on his own account, and was therefore able, for instance, to honour old commitments such as the supply of city hall medals for 's-Hertogenbosch. As Graveur Général he was in charge of the die workshop and of his co-workers. 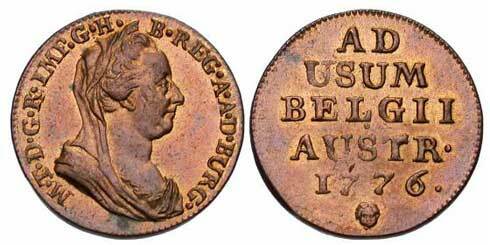 From the start Van Berckel personally produced all dies for medals, but in the early years it was the so-called Graveur Particulier Jean-Baptiste Harreweijn who was responsible for the coinage dies. There are, however, signs that Van Berckel started immediately on the production of the dies for the copper coins. This oord from 1776 has all the features of the work of Van Berckel. Photo: Ex auction 90-692. Jean Elsen, Brussels. 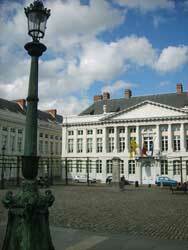 Van Berckel moved his family into a large house on the distinguished Place Saint-Michel in Brussels. He would walk from this home to the Mint in under ten minutes. Apart from the large monument currently in front of his home and the name change into Martelarenplein, the area still has the look it had in Van Berckel’s time. The Mint building however has long since disappeared. It was pulled down after the French period and currently there is an ugly apartment building in its place. 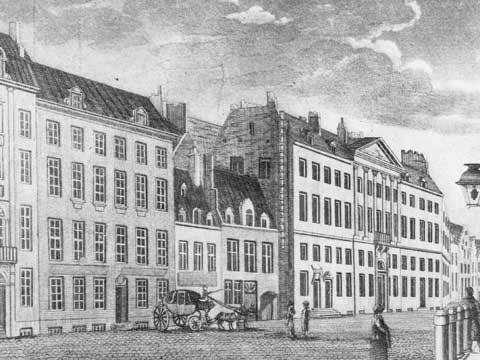 The Muntplein has kept its name because opposite the Mint, even in the days of Van Berckel, stands the Muntschouwburg theatre where in the nineteenth century the revolt against the Dutch would start. Left: Place Saint-Michel, right the Mint end 18th Century. This could not concern Van Berckel and there was, for the moment, little to worry him. He was doing very well. He had a very good occupation and a comfortable income. He had five healthy children with his wife with a sixth child on the way. 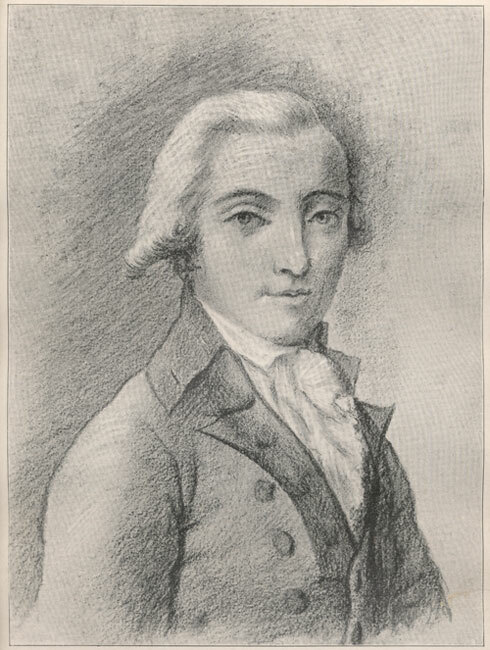 Portrait of Van Berckel made on the 28th January 1786 by his friend, the painter Jean Malpè (1764-1818). During those first years in Brussels, the empress Maria Theresia was still on the throne. She was not much concerned with the Netherlands so far away from Vienna. Her brother in law Charles Alexander of Lorraine, and the local government, ruled in her name in the southern provinces of her extensive realm. Duke Charles was extraordinarily popular. He made many public appearances, was generous with a ready smile and took care that his decisions were always popular with his subjects. He was a real benefactor and did not hesitate to use his own fortune to get the arts to flourish in his region. He had palaces built, parks created, statues and fountains erected. He invited artists from all over Europe to come to Brussels and Theodore van Berckel was one of them. Duke Charles asked Van Berckel to produce a new award medal for the students of the art academies. The Duke was very pleased with the result. 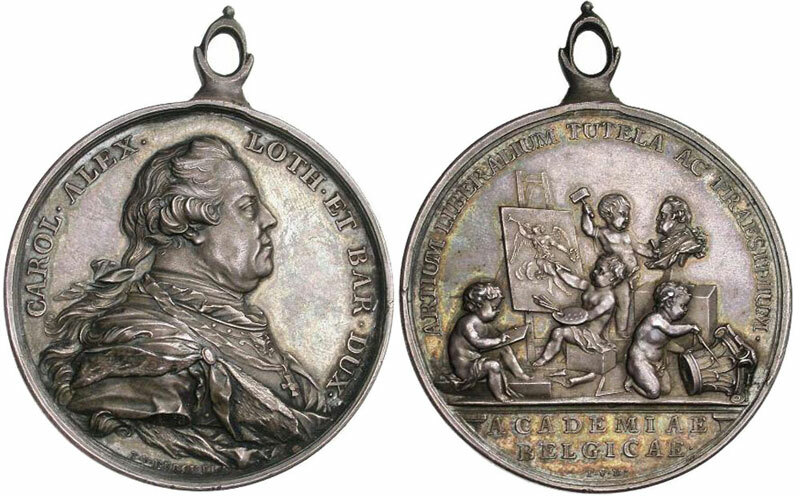 Medals struck for the Academies Des Beaux-arts. Duke Charles died on the 4th July 1780 and on the 29th November that same year, Empress Maria Theresia also died. Unlike his mother, Emperor Joseph II decided to become personally involved with the Netherlands. Emperor Joseph was a strong supporter of the new ideas of the Enlightenment and travelled to the Netherlands in July 1780 to have a look there for himself. To celebrate the occasion of the arrival of Emperor Joseph a range of festive activities were organised, all part of the traditional ‘Joyous Entry’. The plan was that Emperor Joseph would be proclaimed in the capital cities as Duke of Brabant and Luxemburg, Count of Flanders and Hainault etc. He would be expected, at that time, to scatter medals in gold, silver and copper amongst the population. Van Berckel was ordered to make a number of different dies. The largest medals from the series would, obviously, not be distributed among the common people, but nevertheless a large number of precious metal medallions were scattered. Silver inauguration medals and distribution medals of 1780. It appears Joseph II was satisfied with the quality of the medals, but he was less satisfied with what he encountered in the Netherlands. Joseph nominally installed his sister Archduchess Maria Christina and her husband Albert-Casimir of Saxony-Teschen as the new governors of the Austrian Netherlands. In reality however this couple’s opinion counted for little as Joseph had tight hold of the reigns from Vienna. His reform measures would soon bring him into conflict with his dissatisfied subjects in the far-off regions. Virtually during the whole of the eighteenth century jetons d’étrennes were struck each year in the Southern Netherlands. Freely translated these are New Year’s medals that were given to civil servants and dignitaries. From 1776 to 1792 Theodore van Berckel produced a number of these jetons d’étrennes. At that time these were octagonal medals. 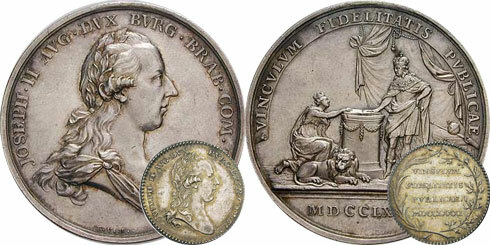 The obverse portrayed the governors and on the reverse was a text concerning a recent event. The first four jetons from the series made by Van Berckel, featured the bust of Duke Charles of Lorraine. After the death of Duke Charles, Maria-Christina and Albert-Casimir, as mentioned above, appeared as a kind of double-act. The royal couple was therefore portrayed together on the jetons d’étrennes. In total 12 different octagonal medals were struck for them. There are even two different medals for the year 1786 , but none for 1789. The Brabant Revolution started that year and the Austrian rulers fled the country. Upon their return, there were another two jetons with the double portrait. Their cousin and adoptive son Archduke Charles of Austria-Teschen superseded the couple in 1793. This animation of the New Year’s medals from the period 1780-1791 gives a good picture of Van Berckel’s artistry. If we superficially inspect the various jetons d’étrennes of Van Berckel, it looks as if they are identical. This, however, is not the case! Van Berckel’s predecessors, Roëttiers and Harrewijn, used the same puncheon for the busts of the governors who subsequently reigned the country. The obverses of the medals made in these years are practically identical. Theodore van Berckel was able to improve on his predecessors’ efforts. He used puncheons with just the ‘naked’ busts of the portrayed individuals. The puncheons were pressed into a soft die and with the aid of a burin and puncheons ‘clothing’ was added. This enabled Theodore van Berckel to dress Their Highnesses every year in new apparel. We know that Van Berckel achieved much acclaim for dressing the governors according to the latest fashion.